Dear EarthTalk: Is it true that palm oil, common in snack foods and health & beauty products, is destroying rainforests? If so, what can consumers do about it? It’s no wonder that worldwide demand for palm oil has surged in recent years. Long used in cosmetics, palm oil is now all the rage in the snack food industry, since it is transfat-free and therefore seen as healthier than the shortening it replaces. But to produce palm oil in large enough quantities to meet growing demand, farmers across Southeast Asia have been clearing huge swaths of biodiversity-rich tropical rainforest to make room for massive palm plantations. Today palm oil production is the largest cause of deforestation in Indonesia and other equatorial countries with dwindling expanses of tropical rainforest. Indonesia’s endangered orangutan population, which depends upon the rainforest, has dwindled by as much as 50 percent in recent years. The clearing of these forests is a big factor in global warming, given how much carbon dioxide (CO2) trees store when left alone. Once forests are cut, tons of CO2 heads skyward where it does the most harm. Also, when not replaced by palm oil plantations, rainforests help maintain water resources by absorbing rainfall and then releasing it into streams and rivers, thus minimizing flooding and soil depletion. 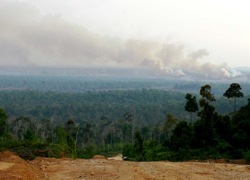 Simply boycotting palm oil and the products containing it may not help, as reduced demand could force the companies behind the plantations to instead initiate more intensive timber harvesting and a widespread conversion of the land to agriculture, which would add a heavy pollution load onto the already compromised land, air and water. It is up to the countries involved in palm oil production to regulate the industry and budget sufficient funds for enforcement. But with huge profits coming in from the sale of palm oil, public officials in Indonesia and elsewhere are loathe to clamp down on their golden goose. Several of the largest palm oil producers have joined forces with banks and nonprofit groups to try to green up the industry. In 2003, some 200 commercial entities in the global palm oil supply chain met and established the Roundtable on Sustainable Palm Oil (RSPO) to promote the growth of palm oil in an environmentally friendly manner. RSPO works to develop definitions and criteria for the sustainable production of palm oil, while facilitating the adoption of more green-friendly practices throughout the industry. The group celebrated its first shipment of “sustainable palm oil” to Europe this past November. Despite progress, many green leaders are skeptical that RSPO has the teeth to make a positive impact on the fast-growing palm oil industry. Greenpeace International considers RSPO to be “little more than greenwash,” pointing out that at least one RSPO-certified producer—United Plantations, a supplier to Nestlé and Unilever—is deforesting Indonesia’s vulnerable peat land forests. And Sinar Mas, another major RSPO player, has cleared tropical rainforest all over the country for its palm oil plantations, and is still expanding rapidly. Greenpeace is calling for a moratorium on deforestation throughout Indonesia so that the RSPO and the government can take stock and then proceed accordingly.